Home Carolynne Maggie Rogers in Concert! Maggie Rogers’ debut album, released this January, marked her as a self-assured star who isn’t afraid to dissect her own flaws, vulnerabilities and experiences to craft tracks that are drenched in palpable emotion. Her remarkable lyrical honesty is unparalleled as is her craft to songs which simultaneously incorporate euphorically swelling synths and her awe-inspiring beautiful song, which can instantaneously fill you in endless energy and awe. 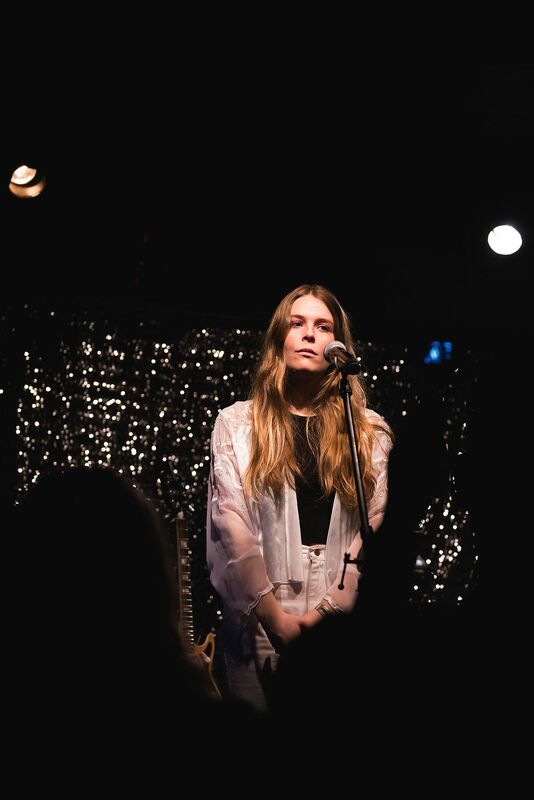 Having supported Mumford & Sons on their arena tour last year and an upcoming show at the iconic Brixton, Maggie Rogers’ show at the Ritz in Manchester offered her devote fans a unique opportunity to see her in a relatively imitate venue. Opening up the show was Mallrat, an Australian musician, singer and rapper whose inspirations encompasses a wide variety of contrasting styles and genres. Accompanied by just a DJ, Mallrat’s delivery of her infectiously upbeat anthems was tirelessly dynamic. The undeniable highlight of her set was ‘Groceries’, a wistfully nostalgic tune that’s immediately endearing. What arguably makes Mallrat such an interesting live act is her unapologetic willingness to combine a multitude of different musical styles to craft infectiously catchy that feel true to her as an artist and an individual. The short wait between Mallrat and Maggie Rogers felt like an eternity; the room was brimming with infused excitement. As Maggie effortlessly approached to the stage to launch into her hit single ‘Give a Little’, the crowd erupted. Engaging the crowd with her effervescent free-flowing movements and her pitch-perfect vocals, which didn’t even flatter as a result of her irrepressibly animated energy, it was clear that the audience’s excitement wasn’t misplaced. From the start, it was clear that her fans were in for an extremely special show. The intoxicatingly energetic ‘Burning’ and the wistfully romantic fan favourite ‘Say It’ followed ‘Give A Little’ but the greatest reaction of thus far was saved for ‘Dog Years’, lifted off of Maggie Roger’s debut EP. Throughout the track, which even didn’t make her debut album, the crowd acted as her endlessly enthusiastic crowd echoing every single word that she exquisitely delivered. Across the night she performed every single track from her debut album in a bewitchingly magnificent fashion and her on-stage chat was incredibly charming, showcasing her humility and humbleness. She also performed a delightful cover of Taylor Swift’s iconic song ‘Tim McGraw’, which delighted her enraptured audience. It’s hard to think of how Maggie Rogers could have put on a better show. Her vocals were astounding, her on-stage movements were enchanting and her accompanying four-piece band played her music with such passion and vigour. Her devoted fans in the audience were mesmerized from the outset but by the end of her set, Maggie Rogers had managed to spellbind the entire venue.